Fantastical Enchantments vol. 2 Mermaids of the Deep has 21 original drawings spaced out every other page, so if you want to cut out a image to frame or hang on the fridge, you can without damaging the other images in the book. So that's 42 pages all together! And a Very Special Thank You to my Kickstarter supporters for making this coloring book possible! Claire O'Conner, MegaZone, Laura Norman, Natalie Martin, Lilly Ibelo, Lisa Marie Nevitt, Christine Walker, Nancy Ballard, Scott Lamky, Arielle Wasiak, Edward Lindquist, Abigail Rae Ricciuti, Eddie Diaz, Paul DiGennaro, Devyn Barat, Sandra C Spencer, Fairy Mary, Jeanne Gaskill, and The Creative Fund. 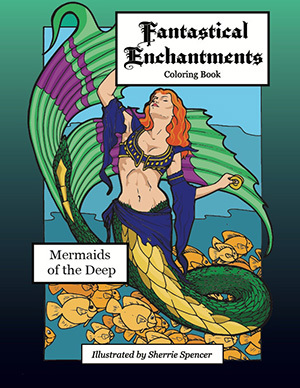 Purchase Fantastical Enchantments vol.2 Mermaids of the Deep Coloring Book!